With theme park staples such as the log flume and the miniature railroad, another staple attraction is the classic Mine Train Coaster. 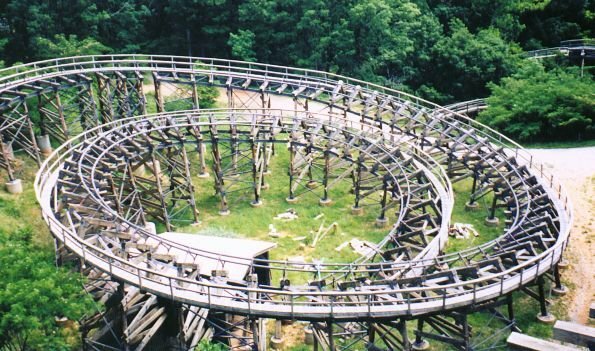 These coasters were one of the things that put the firm known as Arrow Dynamics on the map. (now known as S&S Sansei) Many parks still have them (Disney, SFOT, SDC, etc.) and it makes me wonder with RMC revolutionizing the industry with their refurbs of classic wooden coasters along with their all new custom designs, it seems logical that Mine Trains could be their next big thing. With all the talk and speculation about how TNT could be extended, redone, or even removed (which the latter I think would be a HUGE mistake for the park) what if instead of it being removed, it became the first of its kind RMC Mine Train coaster? Honestly I would love to see Mine Train coasters put back into the spotlight with the use of their modern technology and theming style. Perhaps using a miniaturized version of their Iron Horse track system. Re: RMC Mine Train Coaster? Your logic does make sense for a biz opportunity for RMC.....but is there really any serious buzz about RMC doing that? I'm only hearing rumors about their new track design (boxed rails if I recall).....they need to make sure they don't overextend themselves. Mine coaster will always have a place. TNT is one of the best ever and I would hate to see it messed with much. But then again look at what Disney did with the Seven Dwarfs coaster. Great theming and new technology. Would love to see SDS do something this immersive at the park. Also Alan Schilke who is a designer/consultant for RMC was also a designer/engineer for Arrow back when they were still around. This was one of the things that made me think that RMC could eventually expand into working on building or refurbishing the old style Mine Train coasters since they are still quite popular, are usually themed very well, and provide a nice stepping stone to the bigger and more extreme coasters for kids and families. Of course they could still crank it up a notch as they did to some of the classic wood coasters. They already have a few ex Arrow engineers and designers such as Alan in their ranks either directly or indirectly. 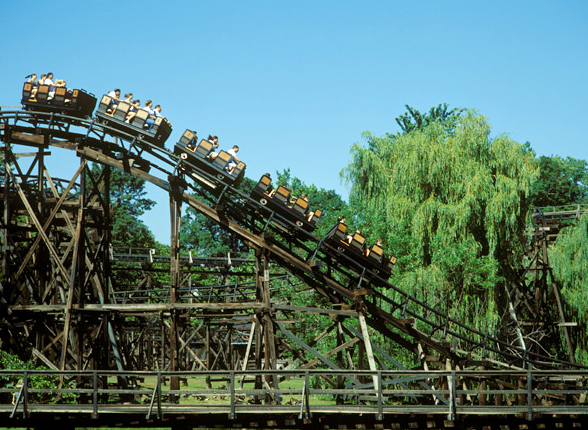 And when you look at the way an RMC wooden coaster is built, particularly with the Iron Horse track system, it is essentially a bigger and more extreme version of the classic Mine Train coaster. Steel tracks on a wooden support structure. It's an interesting idea, but after some mulling I don't think it's too likely. The thing about these RMC-makeovers is that they make sense because they are recycling these huge expensive mega-woodie structures that fell out of use only because of a poorly adapted track system that was impossible to maintain. Mine train coasters are much smaller and already use steel rails, so they make less economic sense to recycle and they don't have as many maintenance issues in the first place. Then again, maybe a park like SDC wants to keep the legacy of a particular ride alive with a new system. However, if they do, they have a lot more options than RMC. I believe at one point the park actually looked at replacing TNT with a newer, larger Vekoma version? There's also Mack and Gerstauler systems which could be really good. After they took out the backwards facing seats I started thinking that replacing TNT with a new Gerstauler version of the same basic thing would probably be a big improvement. Keep the helix in place, and innovate from there. The helix beginning of the ride is the only really special part of TNT that's left right now. I think the park feels like it needs to work really hard to keep pushing "new" rides though, so the idea of replacing/upgrading an old attraction may be a wash with them. Better to take it out completely and throw something gimmicky in like the world's tallest suspended wild mouse. The leg restraints for large ( not fat) adults are horrendous on the SW7DMT. It's 15 to 30 seconds too short but it is impressively done well. And...then there's the Goofy coaster.